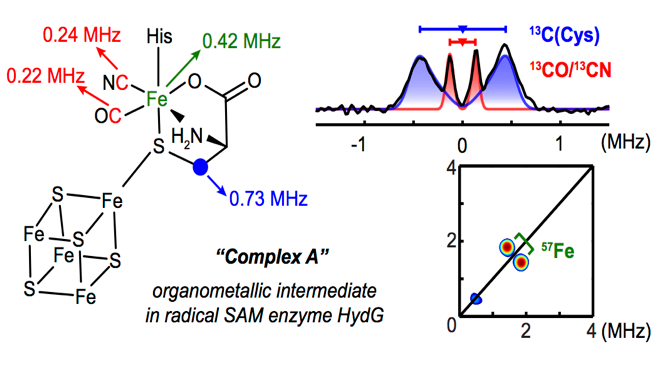 Radical SAM enzymes (1) use a [4Fe-4S] cluster to cleave S-adenosylmethionine to generate the 5’-deoxyadenosyl radical, which in turn abstracts an H-atom from a given rSAM enzyme’s substrate to initiate catalysis. As an example, the RS enzyme HydG lyses tyrosine to generate the CO and CN ligands of the H-cluster of [FeFe] hydrogenase, building an organometallic Fe(CO)2CN(cysteine) moiety that incorporates an iron atom derived from a unique 5-Fe Fe-S cluster (2-7). We have recently characterized the first organometallic intermediate of this catalytic cycle (8) (figure panel). This presentation will focus on the use of EPR spectroscopy to interrogate the geometrical and electronic stuctures of such rSAM enzyme intermediates. Additionally, using HydG along with two other Fe-S maturase enzymes HydE and HydF, we can use cell free synthesis to precisely isotope-edit the H-cluster, which can then be fruitfully probed via EPR spectroscopy targeting its paramagnetic intermediates in the hydrogen oxidation or proton reduction catalytic cycle. New cell free synthesis experiments exploring the effects of deleting subsets of the maturases or adding synthetic analogs in the assembly process are giving new insights into the overall bioassembly of this important metallo-cofactor. 2.Myers et al., J. Am. Chem. Soc. (2014) 136:12237-12240. 5.Dinis et al., Proc. Natl. Acad. Sci. U.S.A. (2015) 112:1362-1367. 6.Suess et al., Proc. Natl. Acad. Sci. U.S.A. (2015) 112:11455-11460. 7.Suess, et al., J. Am. Chem. Soc. (2016) 138:1146-1149. 8.Rao et al., Nat. Chem. (2018) 10:555-560.